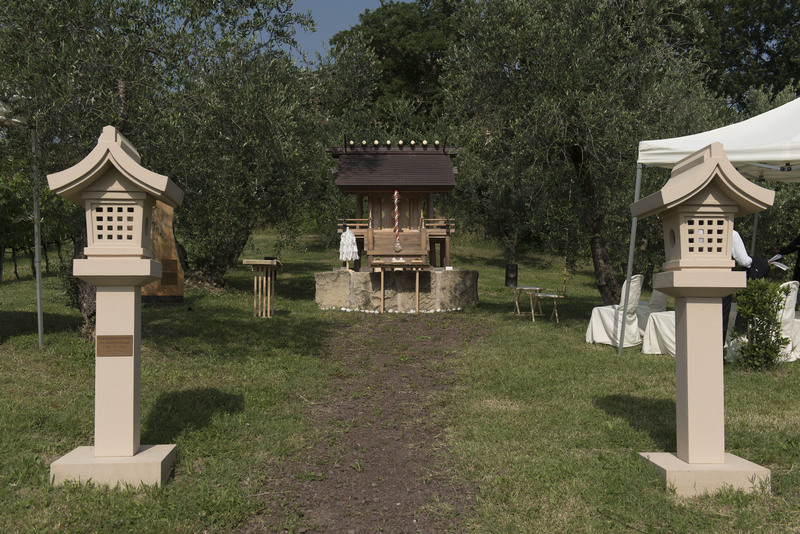 A Shinto Shrine in the heart of San Marino? Hard to imagine the typical natural landscape of the rising sun in the hills of Titan. But the doubters should think again. Serravalle, Podere Lesignano. You can the car at the foot of the cobbled street and start climbing up towards the top of the hill. 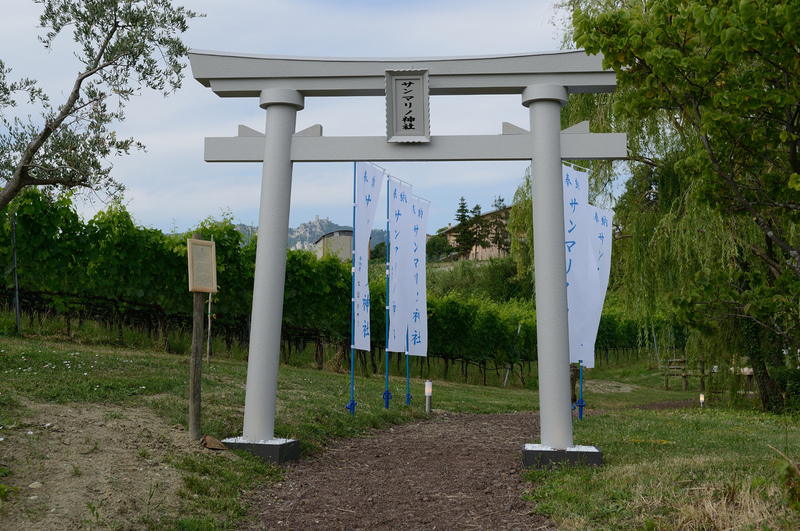 After a few metres you are before the first tangible sign of the temple: the Torii, the traditional Japanese portal access to Jinja. Two vertical and two horizontal, parallel poles, representing the ancient tree trunks that were used to create this structure. Even before you get to the edge of the small lake on which stands the sanctuary, passing under the Torii is already an entry in the spiritual dimension of Shinto. This very distinctive kind of spirituality (often incorrectly classified as religion) has in the harmony and Union with nature on its founding principle. Nature itself is the sanctuary and the entrance is a passage for the man who, from now on, starts to look at himself in a different perspective. The wind that leaves blow in the leaves, the sound of insects, the sound of your own footsteps are with you until you get to the Temizuya (the source for ablution). The snapping of the bamboo that beat rhythmically whenever fills with water and empties breaks the silence of the place. With the ladle you collects the water to wash your hands and mouth, then put it back on the edge of the tub, where the bamboo cane pours water, ready for the next visitor. The shrine is actually a small building, preceded by two Toro (low input columns). Round about the gaze fills with the sanctuary, the fountain, the hills with plants of vines, olive trees and the shores of the Lake. That we breathe is a peace otherwise hard to find. The street, the noise of cars, the buildings, appear to have been cut off, but that are also part of the environment that surrounds you. Here you feel the most intimate part of nature, the one where you get in touch with yourself. The sanctuary is open everytime, there are no timetables, you can freely visit it whenever you want. There are no religious boundaries. Shintoism is not a religion in the classical sense of the term, so it does not conflict with other faiths. In his opening with nature and humanity there is room for all the religious events. You approach the shrine in respectful attitude, without a specific ritual. 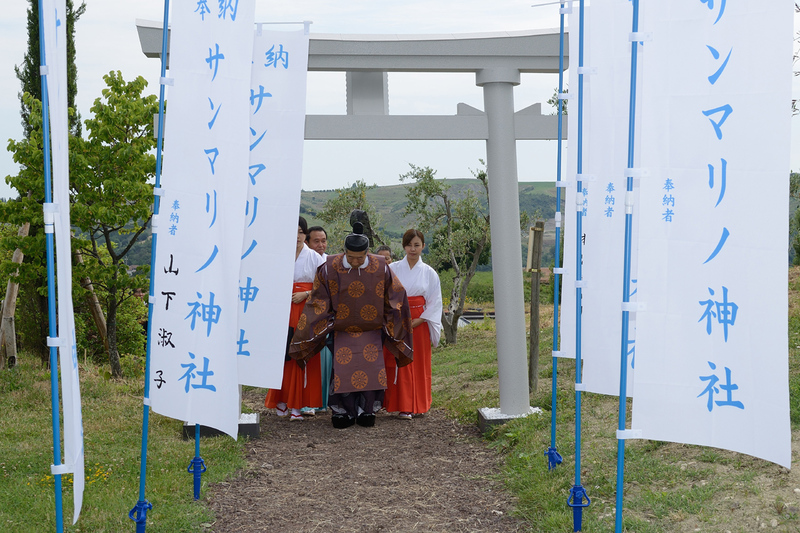 Those who wish can follow tradition: after having washed your hands at Temizuya make two slight bowing in front of Jinja, double tap your hands and make deeper bow before stopping to meditate.